Join investigative journalist and author, Andrew Nikiforuk for a public presentation The Legacy of Fracking: From Earthquakes to Jessica Ernst based on his recent award-winning book Slick Water, a stunning examination of Big Oil and government abuse. Hydraulic fracturing is proven to cause water contamination, seismic activity, landscape industrialization and economic ruin. The harrowing experience of Jessica Ernst reveals how government and regulators flaunt the law to protect the powerful. Come away inspired! 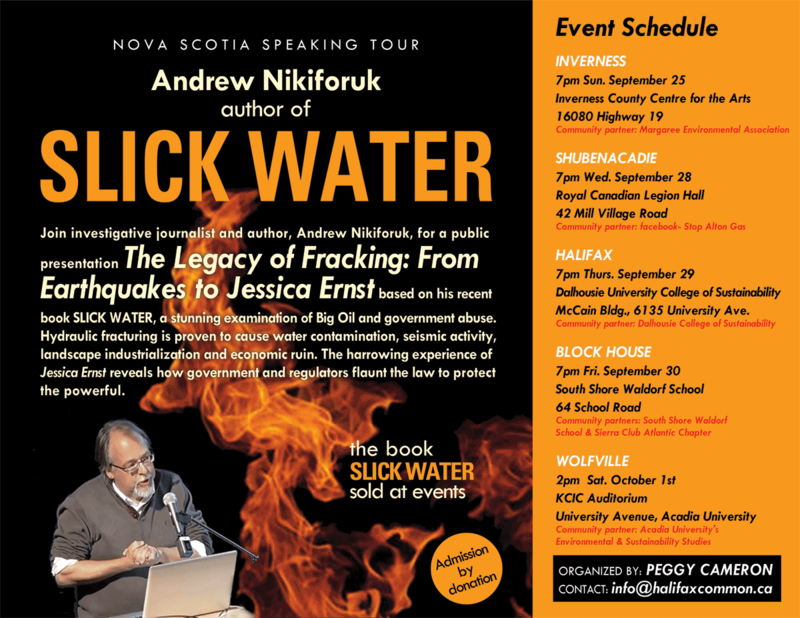 Join award-winning journalist and author Andrew Nikiforuk for a presentation – The Legacy of Fracking: From Earthquakes to Jessica Ernst – based on his recent book Slick Water, a stunning examination of fossil fuel industry and government abuse. Hydraulic fracturing, a highly disruptive technology, has been presented as a novel innovation and economic boom. But scientific evidence tells a different story of water contamination, seismic activity, landscape industrialization and economic ruin. The harrowing experience of Jessica Ernst further illustrates how government and regulators flaunt the law to protect a powerful industry and its dangerous technology. Slick Water will be available for sale at the events. Admission is by donation, except Dalhousie which is free admission. McCain Bldg., 6135 University Ave. This tour is organized by Peggy Cameron and supported by Dalhousie University’s College of Sustainability. Thank you to our community partners: Friends of Halifax Common, Margaree Environmental Association, Dalhousie College of Sustainability, South Shore Waldorf School, Sierra Club Atlantic Chapter and Acadia University’s Environmental & Sustainability Studies.